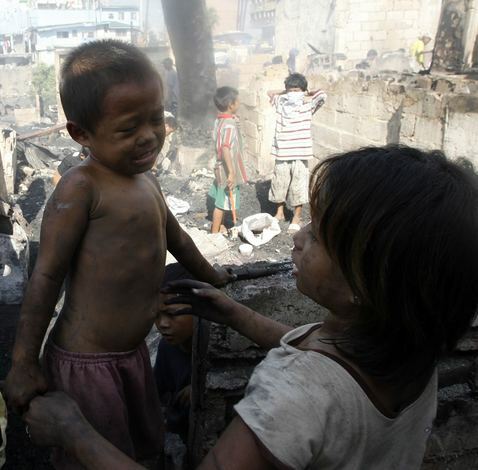 The Smokey Mountain Slum is Manila’s most infamous, partly because of its history and partly because it is known as the world’s most impoverished slum, although I am not sure how it is possible to measure different degrees of poverty at this level, when no one has anything. Smokey Mountain started off life as a small fishing village, where the villagers lived off the daily catch. Life was hard, but was nothing compared to what was to come. Decades ago, Manila without consulting anyone, or informing the villagers, decided that this little fishing village was the perfect place for the city dump. One morning trash collection vehicles arrived unannounced at the village and emptied the contents of their trucks onto the streets. The next morning more trucks came, and still more every day. 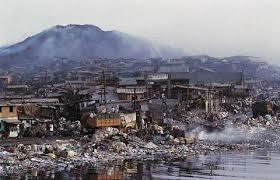 Slowly the fishing village disappeared under a mountain of trash. The villagers lost their homes, their boats and their livelihoods. The city didn’t care. Then twenty years ago a wealthy industrialist took pity on these people and donated a large piece of industrial land to help rehabilitate the villagers. The land had twenty warehouses on it and the industrialist thought they could be used as halfway houses while real homes were found for these people. So the villagers were moved to these warehouses where they were temporarily “stored” . They could view their old home in the distance. Twenty years later these twenty warehouses and the shantytown that grew up around it “store” 120,000 people and there are still no viable plans to move them. The people are reluctant to move despite their living conditions and their lack of income, because they pay no rent. They cannot envisage how they would be able to survive if they had to pay rent. On Pope Francis’s incredibly popular visit to Manila earlier this year he addressed the country and suggested that they should “stop breeding like rabbits”. Of course he made no suggestions as to how to accomplish this when the Catholic Church does not allow the use of contraceptives, although the Philippine government has recently agreed to the free distribution of contraceptives to the poor. Nowhere is this sort of help needed more than in the Smokey Mountain Slum where so many of the population seem to be children. Even before we enter the slum the first thing we notice is the smell. It is so strong that it makes our eyes water. The next thing we notice is the squalor and the filth. The “streets” (narrow passageways between the warehouses) are just rivers of foul smelling mud and waste. The locals have tried to make them navigable by covering them with building rubble. It works in places but elsewhere the noxious mud bubbles up through the rubble. Now we know why the tour company suggested rubber shoes or boots, which of course none of us has. The warehouses are on two levels. The lower level has tiny doorways opening directly from the streets of squalor into tiny bare and filthy rooms filled with people. Each little room is connected to an electricity sub meter. Electricity in Manila is expensive and costs 16 pesos a kilowatt (about 30 cents in American money)at the main meter, but the powers that be (excuse the pun) are determined to make money off even these poor slum residents and the little sub meters charge the inhabitants 32 pesos a kilowatt. There is no running water and no toilets. There are public toilets and showers but again the inhabitants are charged to use them. It costs 5 pesos (10 cents) to urinate and 10 pesos to defecate. I am not sure who polices this, or what the charge is if you do both at the same time. A shower is also 10 pesos. The showers are communal and while the men feel safe taking a shower the women do not. 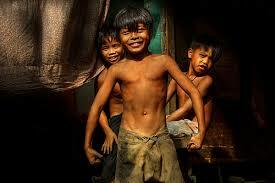 But with their large families very few can afford to use these facilities. Hence the squalid streets and the smell. 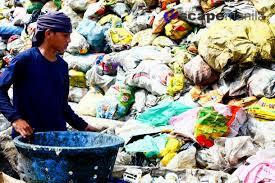 The most treasured trash is food scraps and the trash merchants charge so called “Pagpag “ sellers for any trash bags they collect from the fast food outlets. “Pagpag” means the dust you shake off your clothing or carpet, but in Smokey Mountain’s poverty- stricken world, it means chicken pulled from the trash. Any chicken scraps from these trash bags are collected and “washed”. Then they are fried again, divided up and put in small plastic bags and sold . One bag sells for 20 pesos, which is cheap, but they are mostly bones. It may be the only meat these families get to eat. 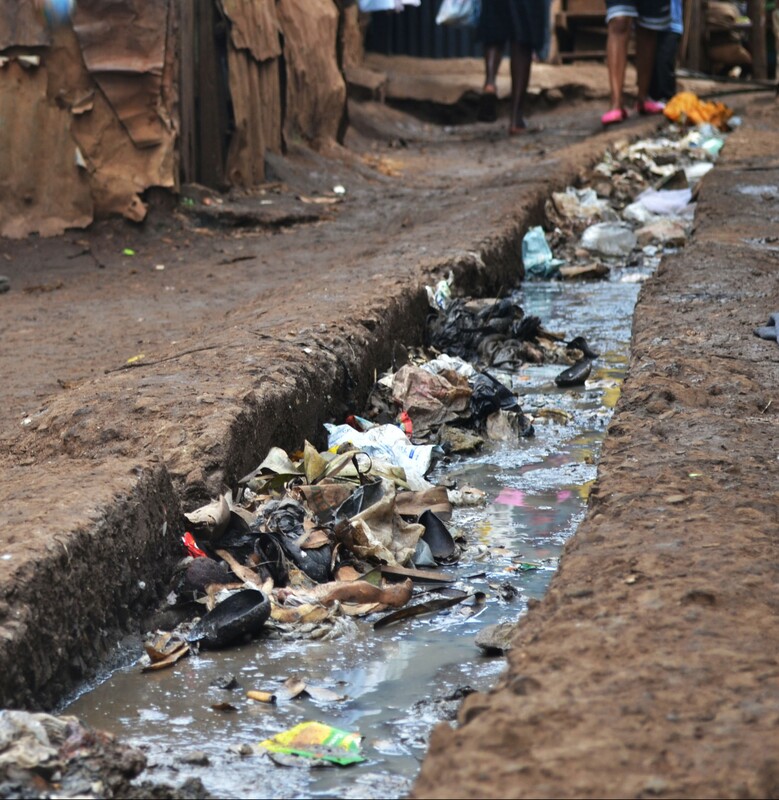 But these slums are not just about the filth and the squalor and the shocking stories. They are about the people who live there. And they are real people, just like you and me, with real stories who, through no fault of their own, have been born into the worst possible circumstances. And this is why I want to come to the slums. I like to meet them, talk to them, laugh with them, cry with them and try and understand what their lives are like. And Smokey Mountain is full of people, and to them we are the oddities. Six large white people in a sea of little brown bodies. They all want a glimpse of us just as we want a glimpse of them. But the assault on all the senses has proved too much for the huge Australians. They seem to be petrified and stay so close to Tessie that we can no longer see her. The daughter spends the entire time holding her hands to her nose and trying not to breathe. None of them can look at the people and just stare nervously at the ground hanging on to Tessie like a life line. 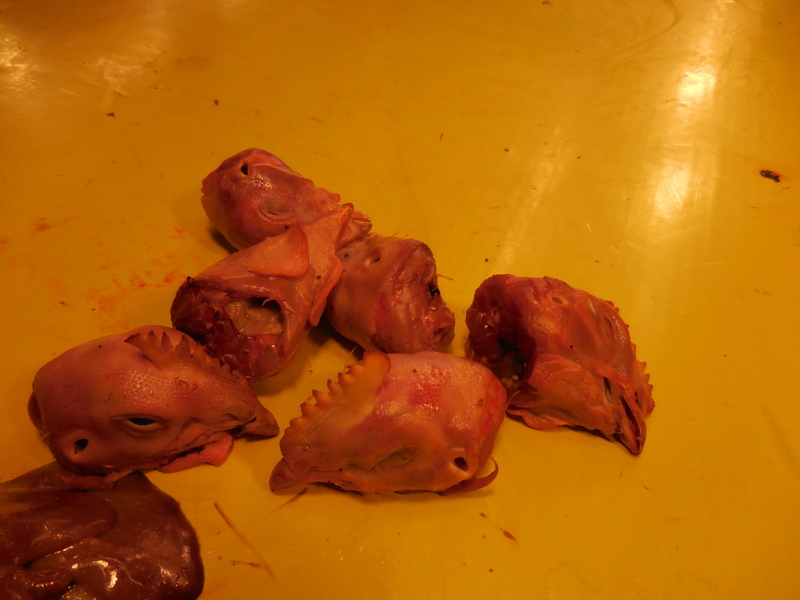 She has already stuck some of the chicken heads on little wooden sticks and deep fried them. She asks me if I would like to try one and seems disappointed when I shake my head. I could say I was being nice and didn’t want to deprive her of her precious meat. But that wasn’t the case. I knew she would be delighted to share with me, but there was no way on earth that I could eat one of those things. Sensing that I might not like them (I try so hard not to screw my face up in horror) , she takes me over to her friend who has bags of Pagpag for sale and asks me if I would like one of those instead. I feel terrible turning down such generous offers of hospitality, but turn them down I do. The boldest little boy is the first to run up to me. He holds up a filthy little hand for me to high five. The Australians recoil at the mere proximity of him, and I must say part of me really doesn’t want to touch him, but of course I do, and as soon as I high five him, others run up wanting to do the same and before I know it I am slapping dozens of grubby little hands. The little boys love it. Laughing and giggling they fight for attention. Then the smallest of them holds up his fists like a boxer and asks if I want to fight him. I pretend to be afraid, and they laugh even louder. Now I have an army of little boxers wanting to take me down. I tell him and discover his name is something I find very hard to pronounce. He giggles as I try to get it right. As I walk along with two children in tow, they get bolder and start holding on to my arm with both hands and swinging on them. Soon I am swinging them round and up in the air, and just like children everywhere they beg me not to stop. Others want to join in the fun and one wraps himself round my leg and hangs on as I walk. 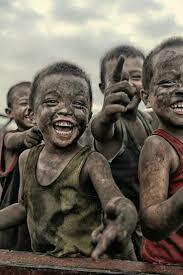 I am swamped with dozens of grubby little hands all wanting to grab my arms and be swung round. Tessie sensing that it is getting out of control, tells the children that we have to leave. They yell and shout and wave goodbye. I look down at my hands and arms and they are black with dirt . The first thing I do when I get back to the ship is to throw out my shoes, put all my clothes in the washing machine and jump in the shower. I get rid of all the dirt but the memories will stay with me forever. Your compassion is wonderful, Andrew. Thank you for sharing this. “…they are real people, just like you and me, with real stories who, through no fault of their own, have been born into the worst possible circumstances.” What a ridiculous roll of the dice birth is. It can be so easy to forget, when we see masses of people crammed into a tiny area who simply don’t have the resources to appear unique, that each and every one of these human beings has a personality, has a name, has a family history, has every single emotion–sorrow, joy, regret, pain, love–that any famous person on the cover of a magazine has. I wish life were more fair, and you have described as well as words ever could how unfair it is. But I also love the way you write about the kids’ sweet personalities, and show that they are also joyful in the middle of all that squalor. Thank you for describing this so vividly and compassionately. This is why, every day that we wake up from a comfortable sleep, we should say ” Thank you, Thank you, Thank you for the life that I have !! !